Most have heard of a prenuptial agreement, which some couples draft before getting married. The document outlines each individual’s rights and responsibilities in the event of a divorce, legal separation, annulment, or if one party dies. But what many do not realize is that a couple who is already married may choose to draft and enter a postnuptial agreement. If you are thinking about a postnuptial agreement in Bellevue, Washington, the following takes a look at what you need to know and how to create one. Get representation from an attorney at the Law Offices of Molly B. Kenny to make sure the agreement is fair and enforceable – call us at 425-460-0550. If you and your spouse decide that entering into a postnuptial agreement is the right choice for you both, then the first step is obtaining the services of an attorney for representation. While you do not need an attorney to draft and create the agreement, she can help you draft one that is fair and enforceable so you avoid potential problems in the event of divorce. Additionally, a witness must be present when you and your spouse sign the agreement. If there is no witness, then the agreement may not be enforceable. Both parties must enter the postnuptial agreement voluntarily – if the signature is in any way forced or coerced, the agreement will be invalid and a judge will not enforce it. Also, full disclosure is essential during a postnuptial agreement. If one party does not fully disclose all his or her assets, debts, or other financial matters, then the agreement may not be valid. For example, if Spouse A is hiding a bank account from Spouse B that contains a large sum, then the postnuptial agreement may not be enforceable. In this case, Spouse B did not enter it with full knowledge of Spouse A’s finances. In the event of divorce or other legal separation, a judge in King County does not have to enforce the agreement. In fact, while a judge usually will adhere to the postnuptial agreement, or at least take it into a consideration, a judge may believe the agreement is unfair. If both sides had representation from an attorney, the document is legal and enforceable, and neither party was coerced into signing, then the judge most likely will enforce the terms within the agreement. A common question that couples filing a postnuptial agreement tend to have is whether they have to file it with the courts. In Washington State, both prenuptial and postnuptial agreements are not filed with the courts at the time of creation; instead, they should be stored in a safe place. 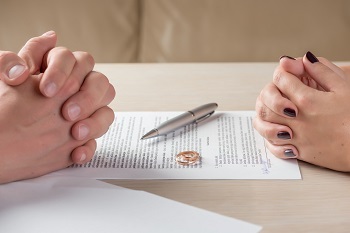 However, in the event of a legal separation or divorce, presenting a postnuptial agreement during mediation proceedings or during a divorce hearing, will be essential. If you need to file for divorce in Bellevue, you will have to file a petition first. You can download the petition for dissolution of marriage online from the Washington Courts’ page, or you can get help from a lawyer. You (or your attorney) will then need to file it with the court. The two places where family law actions are filed in King County are below. You will not present your postnuptial agreement at the time of filing – you should give your postnuptial agreement to your lawyer, who can present it to the courts at the appropriate time. If you would like to create a postnuptial agreement with your spouse, it is important that you have an attorney on your side. If you’re ready to draft and file your agreement, the attorneys at the Law Offices of Molly B. Kenny in Bellevue can help. We will make sure the agreement fairly represents your rights. Get contact us today to begin. Call us at 425-460-0550 or use the form on our contact page to set up your consultation.